immaculate deliver ‘through the line’ campaign for Optegra’s permanent lens replacement procedure, Clarivu™. This included prime time ITV1 TV spots, billboards, national press and online. 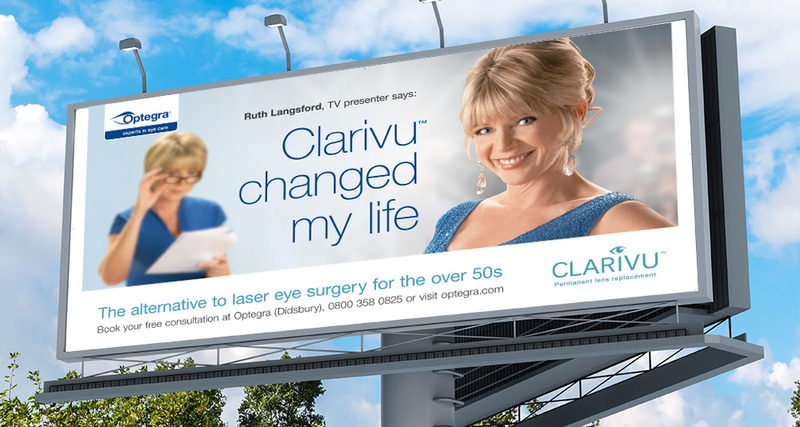 Advertising communicated the story of Ruth Langford – TV presenter on This Morning and Loose Women – before, during and after Clarivu™, which continued in detail on a dedicated website. Clarivu is a clear alternative to laser eye surgery, especially for people over 50 with short and long-sightedness who want to retain their youthful vision and reduce their dependence on glasses or contact lenses. ‘The strategy was simple. From the research, it was obvious that AB women would be the target and whilst a life away from glasses was one of the main key decision criteria to have Clarivu™. We were also told by the audience that ‘feeling younger and more confident’ was also a key driver and that’s where Ruth came in.